Winner of a bunch of awards including 2012 Small E-Retailer of the Year and Good Housekeepings’ Best Valentine’s Roses 2014, you know you’re in safe hands when you order through Serenata Flowers. Since launching in 2003, Serenata has grown to become one of the UK’s premier online florists, staffed by a team of passionate floral artists who make sure that the flowers that you order are fresh, elegant and displayed to perfection. And if you’re not entirely satisfied with your order, Serenata Flowers guarantees to refund it. And it’s not just flowers and gifts that Serenata specialises in. With their gorgeous selection of indoor and outdoor plants and orchids, Serenata can help you create a lavish and tranquil home or garden environment. And if you need any other reasons to shop with Serenata, you can always check out their reviews page, to find out what other people have said about them. How do I use my Serenata Flowers promotional code? Copy a promotional code and head over to the Serenata Flowers website by following the link from vouchercloud. Choose the flower, plant or gift hamper you want and click ‘order now’. Enter your contact details and press ‘continue’. Enter the recipient’s details, delivery instructions and a message if you want to include one. Enter your payment details and your promotional code before confirming your order. Any discounts which don't require a code will be automatically included in your order. If you want to see Seranata’s latest special offers, click here. How can I track my Serenata Flowers order? You can find out where your flowers are by using the Order Tracking function on Serenata’s website. Can I amend my Serenata Flowers order? If you need to amend your order, this can be done through the ‘contact us’ link which can be found here. Can Serenata Flowers guarantee delivery on specific dates? Yes - with the exception of public holidays. 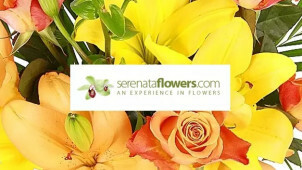 Serenata Flowers using an online contact system which can be found here. Flowers can be ordered for same-day delivery, for a fee of £6.99. Otherwise, Standard delivery items will be delivered the next working day, free of charge. If you need to cancel your order for whatever reason, this must be done 48 hours before delivery date. You can do this via the ‘My account’ area on the website, or by phoning customer services. Offering a huge array of flowers for all occasions including birthdays, new babies and anniversaries, Serenata Flowers is a top online retailer of flowers, seasonal bouquets, plants and gift hampers. Redeem your Serenata Flowers discount code today if you want to buy a beautiful gift for a loved one and take advantage of the huge selection of flowers and bouquets which can reach your door the very day you order them. Not only do you have a fantastic range of options when ordering with Serenata Flowers, but the company is also dedicated to getting your flowers dispatched to you or your loved one as quickly as possible. Get your flowers delivered the next day, or opt for same-day delivery for a small extra fee while you save with Serenata voucher codes. Not only that but you can even get flowers sent to friends and relatives abroad with Serenata Flowers international delivery options. Got a birthday or special occasion coming up and still looking for a present? Serenata Flowers offers an amazing range of gifts with its selection of specially-selected hampers. Lovingly presented, Serenata Flowers hampers can include flowers, chocolates, wines, cheeses and more. A Serenata Flowers voucher code from vouchercloud could help you save on the perfect gift. Crafted to suit all budgets, you can choose from Value Hampers, Pamper Hampers, and Luxury Hampers, to ensure that your next special occasion won’t be forgotten.